*I’ve updated another two of my favorite recipes with new pictures and notes added to the recipe: This delicious basil coconut curry and one of the most delicious ways to serve up pork tenderloin. My husband’s comment mid-forkful of this lasagna: “Who knew a veggie lasagna could be so filling!” And I breathed a sigh of relief since I wasn’t sure how this meatless meal would be received. Of course, that was after his third piece, but even still, this lasagna is hearty and is packed, I mean packed, with vegetables. I’m in a hurry to use up the last of my garden produce and this recipe from my Aunt Jeanette was the perfect way to do it! I altered the recipe a bit, mainly chopping up the vegetables finely enough that they couldn’t be picked out by my children. It worked like magic. They seriously loved this lasagna and with over eight cups of vegetables, I felt like supermom (and then promptly fell from supermom grace after letting them eat hot dogs for the next two nights in a row). If you like your vegetables chunkier, go for it! That is a very adaptable piece of this recipe. In the end, I personally liked the finely chopped vegetables, too. It gave the lasagna a cohesive texture and I wasn’t jarred out of my gustatory bliss by biting into a honkin’ piece of zucchini. My other alteration was to use no-boil noodles, because…well, why not? I love not having to boil them beforehand. 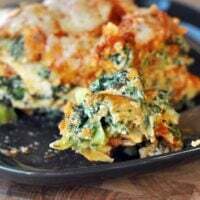 While the lasagna may be full of vitamin-laden veggies, it is also filled to brimming with a delicious ricotta and spinach layer that binds the lasagna perfectly and is helped along by rich, creamy mozzarella and spunky Parmesan cheese. The combination of all the above with the tender noodles and flavorful sauce is utterly fantastic. In a medium bowl, combine the ricotta, spinach and salt. Mix well. Lightly grease a 9X13-inch pan. Spoon about 3/4 cup sauce onto the bottom of the pan and spread around. It will be a thin layer. Cover with four no-boil lasagna noodles, overlapping slightly. Spoon in 1/3 of the lightly steamed vegetables evenly. Spread 1/3 of the ricotta mixture over the vegetables then sprinkle with 1/3 of the mozzarella and 1/4 of the Parmesan cheese. Pour 1/3 of the remaining sauce over the cheese, lightly spreading it to the edges. Repeat the layers (noodles, vegetables, ricotta, mozzarella/parm, sauce) two more times, ending with the last of the sauce. Sprinkle the remaining Parmesan cheese over the top. This lasagna will be piled high – above the rim of your 9X13-inch pan, but it will settle as it bakes. When assembled, this lasagna is piled very high – above the rim of the baking pan. Initially, I thought I might have an exploding volcano of lasagna all over my oven but wasn’t I pleased when it settled perfectly while baking. Be sure, though, to place it on a foil-lined baking sheet to avoid any potential spillovers while it cooks. Can you assemble this lasagna a day before and cook it the next day? Mel this was a great recipe, simple yet delicious! Thank you! I have this in the oven right now, can’t wait to try it! This was Devine! We loved the heartiness of the Lasgana without the meat. It was a little liquidy but the brand of sauce I had on hand was to blame. Will defiantly try again with different brand of sauce or your homemade sauce. One of my daughters who avoids red sauce had a second helping and loved it. Oh I did use regular (not the no-boil type) noodles that I barely undercooked and cut in half for the 8x8s. I used a couple more than the recipe called for. Obviously this is a more involved meal, especially if you make your own sauce. I loved it and my family ate way more veggies then they knew. I used my food processor to dice them up pretty good then added some hand chopped for texture. I also split up the meal between 3 8×8 containers, froze 2 before baking, and had plenty for our little family of 4. Freezing tip: I line my disposable 8x8s with double foil, fill it up with the meal, top with lightly greased foil, and freeze. After its frozen I pop the foil wrapped dinner out of the dish then throw it in a gallon freezer baggy, writing instructions on it. This frees up my containers. Then when I go to cook it I just pop it out of the baggy and back into the container. Jackie – I have a metal steamer basket I put in a large pot. You could also steam them in the microwave. I toss the vegetables with the salt before steaming. How do you steam the vegetables in this recipe. Also, is the salt suppose to be sprinkle on the vegetables or is it suppose to be mixed in the water. I substituted butternut squash I had on hand for the yellow squash, which I didn’t have any of. I didn’t chop the veggies–I shredded them all in a food processor. Made for quick work and my kids are more likely to eat veggies the smaller they are. I also substituted finely chopped fresh spinach for the frozen. I cooked it 1 hour and 20 minutes and I think it still could have used more time–it just never really heated through. It really is a thick lasagna and certainly piles high! Mine also came out watery and I thought it might also benefit from some seasonings, but I am sold on how healthy and tasty it was. I didn’t even bother making a side dish–it has it all in one fabulous piece! My one year old inhaled it. My five and three year old still required coaxing (the case with anything except mac n’ cheese from the box and your smothered pork chops). I am wondering if this lasagna would be ok to make ahead and then bake the next day? I am planning on making your mom’s lasagna too, and I know that you said that one can be kept in the refirgerator for up to 2 days. Have you ever done that with this vegetable lasagna? Thanks! Can’t wait to make it! Mindy – I think this lasagna would fare quite well being made the day before. Let me know how you like it! This recipe is absolutely my favourite of all time!!! I have made it before and this week we are having a vegetarian week at home so it was an obvious choice for one night’s dinner. I grate the veggies (other than the broccoli) because of my picky teenager and it still works perfectly. Also I add some Monteray Jack cheese as well–can’t have enough cheese in this recipe. Best vegetarian lasagna ever! Thanks. Is there something I could substitute the ricotta with? (Cottage cheese/cream cheese?) This looks like a really delicious dish! Lisa, you can try cottage cheese but the texture/runniness may make the consistency of the lasagna different so just keep an eye on that. You know, I used frozen chopped broccoli instead of fresh, to save time. Maybe that contributed to the watery problem. At any rate, I cooked it about 20 add’l minutes, and then refrigerated overnight. Today, it is the perfect consistency and slices up like a dream. Thanks for this new keeper-recipe! I am new to your blog but love it so much!!!! Delicious! Even my very veggie resistant kids ate it without too many complaints (trust me, that’s about as much as I can hope for!). The only thing is that it came out very watery and under=cooked when I cooked it as directed. Even after @ 15 minutes extra cooking time (to make the veggies slightly less crunchy), it was still watery. Not sure what I did wrong. Caitlin – glad you liked this despite the watery issues. You may not have done anything wrong. Ovens can vary in temperature and my guess is that it just needed to be cooked for even longer (and letting it sit out of the oven for possibly longer, too) to help it thicken and set up. can u have a substitute for spinach? Hi Jill – I don’t have a substitute for the spinach since it makes up a large part of the bulk in the lasagna. Sorry! This lasagna totally rocks! It is amazing! Call me crazy, but I actually really like Stouffer’s vegetable lasagna w/white sauce. This recipe reminded me of that dish so I made it the other night and my whole family loved it! If you ever mess around with a white sauce for this recipe let me know!! Melanie – glad you liked this and if I get to experimenting with a white sauce, you’ll be the first to know. Oh yes! Me too!! I want to try it with a white sauce too! I made this and it was soooo tasty. Next time I think I might add garlic for sure, maybe roasted red peppers or onions? Also, it made twelve large lasagna servings. Thanks for the recipe! Neysa – thanks for checking in on this recipe. I think your future additions sound delicious! My carnivore husband loved this meal. Thanks for the recipe! I used my food processor to shred all the veggies except the broccoli. It turned out great. I made a variation of this for dinner tonight and it’s baking now. I used less vegetables and mixed the vegetables with the ricotta, a beaten egg, mozzarella, and parmesan. And I stuffed manicotti with the mixture. Thanks for the idea. It’s smelling great! Katie – what a brilliant idea to use this for manicotti. One of those “why didn’t I think of that” moments! I made this the other night and it was AWESOME!!! thanks. This is in my oven right now, and it smells delicious! Thank you for posting so many recipes loaded with veggies (Garden veggie soup, cauliflower pasta). We’ve been ENJOYING eating healthier! Carlin – hope you liked the lasagna! I made this for dinner tonight. Excellent!! It is definitely a keeper. Thanks for sharing it. Thanks, Gail! So glad you liked it. i made this last night and it was amazing! i knew this recipe was a keeper when i caught my hubby with the fridge door open at 2 am eating the cold leftovers straight out of the pan…lol! huge hit in our house last night! thanks mel! Thanks for the recipe. I needed another way to be using up all this squash I have and this is perfect! I made it tonight and we enjoyed it. The spinach seems a little overbearing, so I might try less next time so we can taste the other vegetables a little more. Also, I cooked it according to the instructions in the recipe, but it seemed undercooked. I’ll have to watch that next time I make. It is a definite keeper! Laurel – glad you liked this and I always love to know when someone finds a way(s) to adapt a recipe to make them love it even more! Congrats on this recipe being featured on Tasty Kitchen today! Will have to try it! I made this recipe yesterday and it was awesome! My finance isn’t a big veggie eater and even he liked it! I’d like to try making it with egg plant in place of the noodles. Bridget – I’ve been waiting to hear the first review of this recipe and I’m thrilled to know you and your fiance liked it! I think eggplant would take this over-the-top in the veggie department and that wouldn’t be a bad thing! making this tonight! looks delish! Your photos are gorgeous and show this lasagna off to perfection. I love those no-boil noodles…so easy. I remember when there wasn’t such a thing. The generous amount of parmesan in this recipe tells me this must taste amazing. Printing out the recipe now. What a stupendous way to get those veggies in…looks delicious! Aunt Jeanette gave me this recipe as well, and I made it a few years ago. I LOVED it! Even my husband ate it, who never eats anything without meat. It’s definitely a keeper! Thanks for reminding me about it, I think I may make it for dinner one of these nights. Cat – I’m not sure why you can’t print the recipe. Do you get an error message? What exactly is happening? When I followed the same links, I was able to print so if you are still having the same issues, let me know more information and I’ll try to work it out! Erin – well, my disclaimer has to be that my boys don’t always eat everything I make, although those times are getting fewer and farther between. My big “thing” is that I cook a huge variety of foods. Because of that, my boys aren’t surprised when a dish with an unusual-for-them ingredient comes to the table. Because they are used to trying new foods they aren’t as nervous as they used to be to try new things (my rule is they have to take a bite for every year of age, no matter if they think they are going to vomit or not – we don’t make them clear their plate but they have to try everything on their plate even if they have to wash it down with a glass of milk or eat it with another food on the table). The funny (well, not so funny to me) thing is that the two foods they have the most trouble eating are black beans and potatoes. Ordinary! But they’ll eat shrimp, sushi rolls, clam pizza, etc without batting an eyelash. So obviously I don’t have all the answers. My recommendation would be to continue introducing new recipes and encouraging them to try it – make it into a fun game. My kids love it when I say I’m going to close my eyes and that when I open them, I want to be “shocked beyond belief” that they have eaten their bite. For some reason, this gets them going. Of course I have to yell and dance around and make a big deal out of it. It gets exhausting but is worth it when they eat something they swore would make them vomit and they actually end up liking it. My husband and I are very matter-of-fact about dinner: eat it without complaining and life will be better for it. Good luck! Jenny – yes, I use regular old yellow crookneck squash. This recipe seems pretty adaptable, though, so patty pan squash or another kind of yellow squash would probably work well, also! My 6-year-old just said “Wow, that looks good. Does it have a recipe?” “Yes,” I replied. “Then you should print it off and make it.” I gave him a high five. Amazing! I wonder if my little carnivores would notice that there’s no meat in this? Must try! Just wondering what kind of squash you used? Yellow summer squash? I’m excited to try it! BTW- I LOVE your site and always feel inspired and recharged to try new things. If I am ever in a cooking “funk” I can always count on one of your recipes to get me out of it and enjoy cooking again! Thanks! well, i definitely wouldn’t miss the meat here–what a massive medley of terrific veggies! i, too, would find a big ol’ piece of zuke rather off-putting, so good call there. I love your blog and all your yummy recipes. Only problem is, my boys are sooo picky! It’s so frustrating. Any advice on how to deal with picky eaters? How do you get your kids to eat everything you make?? OMG!! This looks brilliant! This is the first lasagna recipe I’ve seen in a long time that I actually wanna make! Kudos to you!! 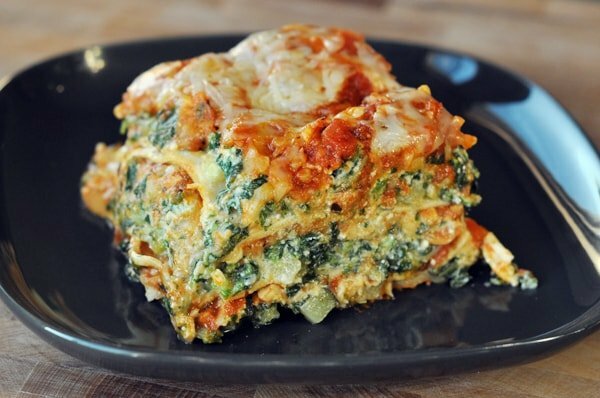 This lasagna looks SO delicious…but how could it not be when it’s loaded with all those great veggies! I tried printing your recipe and Google Docs keeps coming up and won’t let me print. Some of your other recipes do this, too but not all. What is this all about? This just got put on my meal menu for next week, but I’m debating making it tonight, it. looks. so. good. I bet my husband wouldn’t even notice there’s no meal and if it gets my almost 2 yr old to eat her veggies, it will for sure be a winner. Can’t wait to try it out! That looks fantastic!! This one is going on my menu for sure! It’s bookmarked! And looks delicious! I may have to adjust the menu plan I just made to fit this in while I still have piles of zucchini. Can’t wait to try this! I love your recipes! Oh, that does look good and I’m not totally into veggie loaded meals. My kiddos on the other hand do. No-boil noddles make this even better. Did you use meat in your sauce? Hi Katie – when I use my homemade sauce, yes, the lasagna ends up having meat in it. This time (for this post and picture), I used an organic marinara sauce I found at Sam’s Club and it was delicious even though it was completely meatless. This looks fantastic! All your lasagna’s I love so I’m sure this will be amazing too! I love that you are posting more meatless meals, while I LOVE my meat, we are trying to a couple meatless meals a week too, so Thanks! Clever idea, chopping up the veggies. This looks beautiful. 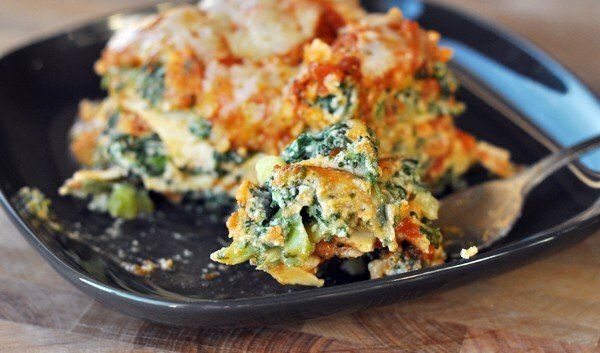 I love the looks of this lasagna with so many veggies. I think this is the best one I’ve seen, so of course I must try it!